The book opens to Hannah and Nathaniel Wilde driving to a remote cottage in Snowdonia in the middle of the night. He is bleeding profusely in the passenger seat, while she scans the road and buildings ahead with binoculars; their nine year old daughter Leah sleeps exhaustedly in the back seat. Hannah is unsure how seriously Nate is hurt, but has got this far without stopping for any medical help – all she cares about is reaching the safe house undetected. Finally, satisfied the way ahead is clear and they have not been followed, the family park their car at the back of the house and Hannah helps her husband to the sofa in the kitchen to see how badly injured he is. They are too remote to be on the grid and the generator is empty, so she has to light the room with a few candles she finds in a store cupboard. Hannah is about to return to the car for the child, when a man unexpectedly arrives at the cottage door, positioning himself between her and Leah. She recognises him as a friend of her father’s, yet questions him carefully to validate his identity before she will let him treat her husband for the deep stab wounds he has suffered. As important as Nate’s life is, knowing this man will not be a threat to the family is even more important. The reason for Hannah’s suspicion and fear lies in a bundle of diaries, held together with string and carried with the family wherever they go. Even when fleeing in an emergency with no other possessions, the diaries stay with her. Written in different hands, in different languages over many years, they tell of the history of her family, of an old rumour stalking her line, of something that has haunted five generations. To her they are an information source and survival guide; to others they are merely superstitious retellings from Hungarian folklore. Hannah has no patience for those who won’t believe their contents. She lives by the code that has kept her alive this long, and which she hopes will continue to keep her daughter safe: verify everyone, trust no one, and if in any doubt, run. The String Diaries is a supernatural thriller in the same mould as Elizabeth Kostova’s The Historian and Deborah Harkness’ A Discovery of Witches, both books I immensely enjoyed. That is to say, this is very much a superior supernatural story, intelligently plotted and well written. The difference, however, lies in the Diaries not having a vampire in sight: the basis here is in an obscure piece of Hungarian mythology that gives the novel something…well, novel. Perhaps it was that I have visited and liked Budapest, but I found the Hungarian origin of this story to be refreshing change from the norm, and the sections of narration set in the city to be full of life. I think the author has also enjoyed visits there, too. Certainly, when interviewed, he admitted to having hired a Hungarian tutor during the course of writing the book to better understand the language and culture the folk tales come from. For me, the real strength in the storytelling lay in the way that Jones could create fear and tension so well in his writing. I found myself gasping and reacting to the book as the plot developed, something I rarely do with novels. I was hard to believe in many places that this was his debut work. 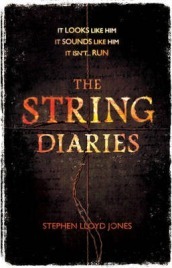 I note on Headline’s website that he is currently planning out a sequel, and very much look forward to it coming out – although given that The String Diaries doesn’t get released until July, I have sadly got a very long wait ahead of me. I thoroughly enjoyed The String Diaries. I read a proof copy so have not yet seen the book in its final form, but I do hope that the final release has a pronunciation guide included in it – as exotic as those Hungarian words looked on the page, I would have liked to have known what they were supposed to sound like, rather than the mangled efforts that I came out with! Published by Headline – to be released July 2013. With thanks to Headline for sending me this review copy. One Comment on "The String Diaries"
This sounds excellent – I loved The Historian, and this sounds right up my street.